Temasek Outperforms Berkshire Hathaway- Really? This has to be one of the more ridiculous article to come out from the Straits Times. 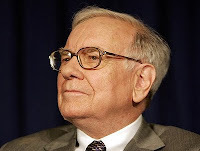 It claims that the Singapore Government linked organisation, Temasek, did better than Berkshire Hathaway which is the investment vehicle for Warren Buffett. Without stating on what basis it is comparing, it went on to compare the prices of the Berkshire Hathaway with the investment returns of Temasek. It is like comparing that the Toyota Vios costs $100 million to conceptualise and make, but the Ferrari costs $100,000. Any Social Studies student taking the 'O' levels worth their salt would know that for any comparison, you would have to have a common basis for comparison. While this has been rather dated news, since it was reported last month, the good news is that there is already a whole bunch of more savvy Singaporeans who have jumped to the defence of the sage of Omaha and debunked the false and erroneous reporting of the Straits Times. Au Weihua wrote to the ST to show that the annualised returns of Berkshire Hathaway is actually 6.56%, higher than that of Temasek at 5.4%. Looking at how Temasek compared itself with Berkshire Hathaway, I wouldn't put it past them to do a Beardstown Ladies too.